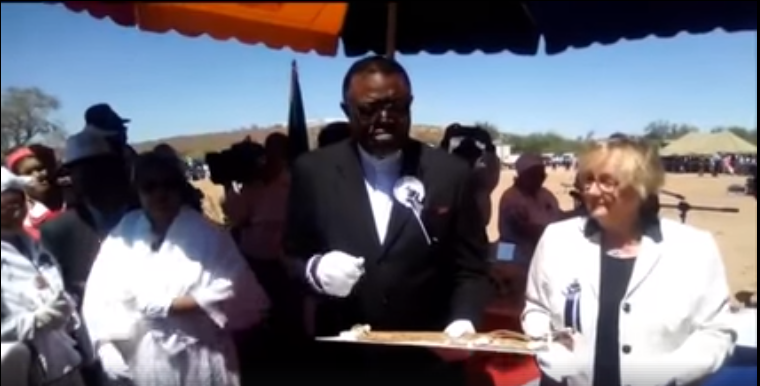 President Hage Geingob this morning arrived at the desolate town of Gibeon, a dry and hot place which once served as a fortress for the late Hendrik Witbooi, whose bible and whip arrived in Namibia. Flanked by high level Cabinet Ministers, as well the Vice President, Nangolo Mbumba, Nama traditional leaders and a high level German Delegation, Dr. Geingob stated that if Namibians are ever to move forward, then it is important for the German government to admit the wrongs commuted against the people of Namibia. “In doing so we expect that the most appropriate admission of this genocide will be the issuing of an apology by Germany. It is with this reality in mind that we are gathered here” Dr. Geingob said. He added that an event such as this will evoke painful memories, given the history of Namibia. However the repatriation of the bible and whip of Kaptein Witbooi is an occasion for Namibia to pay tribute to one of its former heroes. 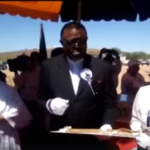 It is true that an event such as this will evoke painful memories, given the history of our country, but similarly, the repatriation of the bible and whip of Kaptein Hendrik Witbooi, is an occasion for Namibia to pay honour to one of its foremost heroes. Such an event should be graced by an atmosphere of peace, sensitivity and understanding, instead of being demeaned by misgivings and hostility. It is in the spirit of recognizing and honouring an iconic figure in our struggle against colonialism, that we have all come here. This is a historic occasion in the history of our country and we should accord it the honour it deserves and not resort to the growing trend of using national events for political point scoring. It is therefore imperative that we put aside personal interests and hold hands by holding a peaceful and dignified ceremony, befitting of our national hero, Kaptein Hendrik Witbooi. At the onset, I wish to thank Ms. Theresia Bauer, Minister of Science, Research and Arts Baden-Württemberg; for having travelled to Namibia to deliver these two important treasures of our nation’s history. We are glad you are here, especially at a time when Namibia and Germany are engaged in State-to-State negotiations on the issue of genocide. The Genocide of 1904-1908 is an event which has left a deep scar on the Namibian people. The effects of the torture, collective punishment and ultimate racial extermination of Namibians by German imperialist soldiers are felt to this day. If we are to move forward, then it is important for the German Government to admit the wrongs committed against the people of Namibia. In so doing, we expect that the most appropriate admission of this genocide will be the issuing by Germany of an apology which will be acceptable to the Namibian people. It is with this reality in mind that we are gathered here today. Our gathering here today is in honour of a poignant period in our nation’s history, when colossal personalities were called upon to defend the dignity of their people and territory. The brutal wave of colonial aggression which characterised the Scramble for Africa did not spare Namibia; in fact, it drowned our people in a swell of vicious oppression. When the forces of imperialist aggression, in the form of the German army under Kurt von François decided to invade Greater Namaqualand, today known as the Southern Namibia, destiny produced a man for the hour. A man who would be described by historians as: “One of the most powerful African leaders at the time when European imperialism began to carve up Africa into colonies.” A man, highly revered and affectionately known as Khaob !Nanseb /Gabemab – The captain who disappears in the grass. I am referring to none other than Kaptein Hendrik Witbooi, the man of the hour and the hero for who we have gathered here today to honour through this noble ceremony. Kaptein Hendrik Witbooi was born at a time when colonialism was at its zenith. The powers of that time, were carving up African territory, driven by the lust for resources and subsequent wealth. It is during this period that many Namibian people were separated by boundaries that paid no consideration to the demographics of the region. Our ancestors, and all of us present here today, are victims of these indiscriminate annexations; annexations which dispossessed Namibians of their land, by force and without compensation. It is in the spirit of Hendrik Witbooi, that selfless Namibians, the likes such as our Founding Father, Former President and other veterans who are here today, launched the armed struggle nearly a century later to restore the dignity of the oppressed people of Namibia. So as I conclude, I call on all Namibians to honour the memory of Kaptein Hendrik Witbooi by holding hands and uniting under the banner of unity – under the roof of our Namibian House to say, never again shall the people of Namibia suffer under imperialist aggression; never again shall the people of Namibia suffer under racist violence; never again shall the people of Namibia be torn apart by tribal and ethnic conflict and never again shall the people of Namibia have to cross many rivers of blood to achieve their freedom. Previous : Trustco arrow hits the Golden spot!